The Navy commissioned two Perry-class frigates today in Kaohsiung's Zuoying District. The ships, called Ming Chuan and Feng Chia, promise to strengthen Taiwan's combat capabilities in the Taiwan Strait with their improved anti-submarine and sonar systems. The ships will be operated by Navy officers trained on the systems in the U.S., and they'll be put to work to protect Taiwan's waters. Draped in blue, white and red sashes, new warships are commissioned by Taiwan's navy. President Tsai attended the ceremony in formal military dress. The new ships, called Ming Chuan and Feng Chia, are Perry-class frigates procured from the U.S., and they have superior anti-submarine capabilities. But even as Taiwan's military equipment got an upgrade, President Tsai urged vigilance against the varying forms of security threats from China. There are three expectations for the military that it mustn't forget. It mustn't forget its mission to protect Taiwan. It mustn't forget to strive for regional peace and stability, and it mustn't forget the threat from outside the nation's borders. Through new forms of technology, the internet and new media, numerous counts of disinformation have penetrated Taiwan's society. Incessant network attacks have targeted our government and industries. These things present a significant risk to national security. To accommodate the arrival of the two warships, the Navy sent officers to the U.S. to receive systems training in 2016. The ship's underwater combat systems, as well as its towed array sonar system, guarantee our combat capabilities in the Taiwan Strait. The ship is currently attached to the Magong 146 fleet, and the Navy will incorporate it into its overall strategic plans. With grand ceremony, the new warships formally entered the combat ranks. 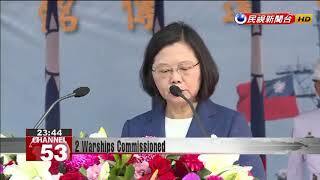 The Navy expects the ships to improve its defense of Taiwan's waters and bolster national security.